Branding and web development based on strategy, UX design, and most importantly, customer experience. We have all the essentials to turn your idea into a design that sings. Let’s work together to tell a story worth hearing. Irondale in Brooklyn, New York houses one of the most diverse, genuinely creative companies we have ever seen. 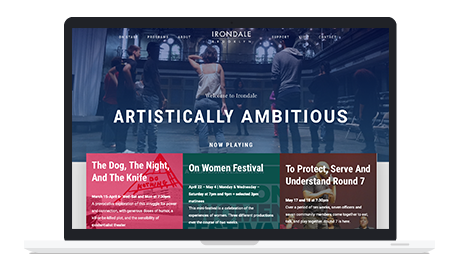 Together, we developed a site that strives to mesh the lines between community and theater into a collaborative, living work of art. Design with purpose. We work with clients large and small to realize their biggest visions. Our team is uniquely crafted to understand your audience and deliver with gusto. You are our collaborator. We work together at every stage to design a brand foundation that can scale. When we’re finished, your clients will want to become your partners. Too many roads lead to none. We do our homework and leverage our expertise to create a streamlined process that ensures we meet your business goals. Design is communication. No matter the medium or size, we pay close attention to every pixel, detail, and word to ensure your project is an extension of the passion you possess. Learn more about how our team helps you go beyond in business. Elfatrany Design is as professional as they come. I have never worked with an organization so focused on learning my needs and who I am so that a site can be created that is truly reflective of my brand, story and mission. Communication was thorough, efficient and seamless throughout the process, and the finished product was beyond my expectations. From concept to implementation, they proved to be uniquely creative, keenly intuitive, diligent and highly motivated. In an abbreviated timeline, they formulated a plan and delivered a fully interactive, beautifully designed product. We could not have anticipated a better experience and we are thoroughly satisfied with our new website. Elfatrany Design instantly recognized what I wanted and transformed that idea into a stunning visual design. Our progression from inception to maturity was seamless, cooperative and completely fluid. I don't think I could have predicted a better outcome or working relationship than what I experienced. Elfatrany Design has proven to be a top notch agency with expertise ranging from concept to final execution handled in an ultra professional manner. I am very pleased with the results of our brand. Elfatrany Design helped my company to refresh its brand. Their project methodology was well-planned and well-executed. They placed great emphasis on understanding both my requirements and my sense of style as they started into the creative process. Sammy, Founder of Elfatrany Design, brings a calm intelligence in his approach to every task large and small. He always exceeds expectations and often the result is more successful than originally conceived. His agency has a refined approach to design and a terrific ability to focus on marketing and branding.